Dairy products play a major role in many consumers’ daily diet. It is estimated that the dairy industry generates 17% of total food revenues worldwide. 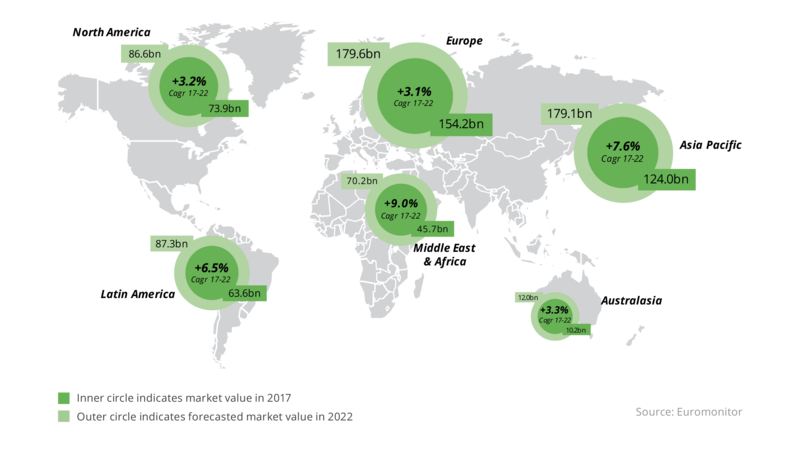 The global dairy market size was estimated at US$471.6 billion in 2017 (having grown by a CAGR of 2.8% over the 2012–2017 period) and is expected to reach US$614.7 billion by 2022. Europe and Asia Pacific are the dairy industry’s largest markets, accounting for ca. 60% of total market size. In 2017, Asia Pacific and the Middle East & Africa registered the most significant dairy consumption growth, due to a strong demand for fresh milk (mainly driven by the expanding population). On the other hand, Western Europe (CAGR of -0.6%, 2012–2017) has the most stagnant dairy market, due to slow population growth and the growing interest of consumers in dairy alternative foods. In terms of sales, cheese is the key dairy subcategory in Europe and the Americas, while drinking milk products dominate the other markets. The yogurt and sour milk products category is expected to grow fastest in each region by 2022, as consumers recognize yogurt’s health benefits. By contrast, these health and wellness trends are hindering the growth of butter and margarine products in every region. Global cheese product exports totalled US$30.4 billion in 2017, registering a year-over-year growth of +14.2%. However, the value is still lower if compared to 2013 (-3.8%). European countries are dominating the trade balance, accounting for 82.4% of globally exported cheese. 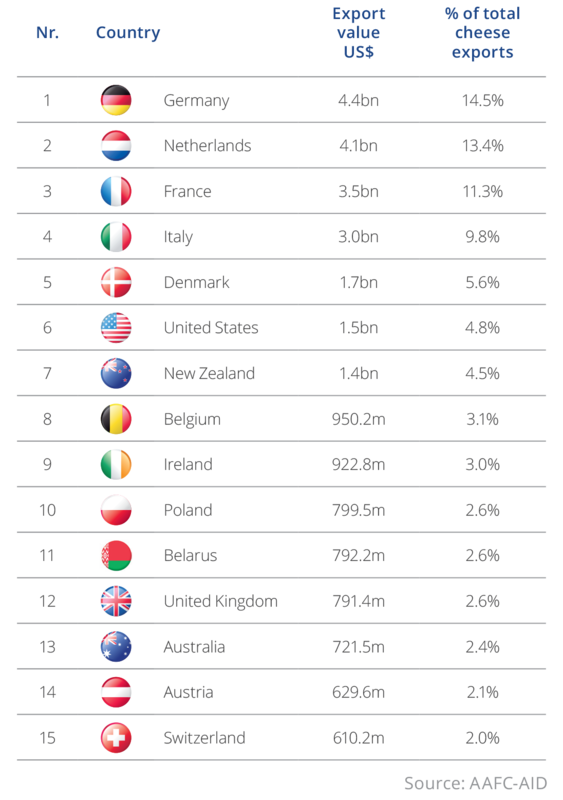 The only non-European countries appearing in the top fifteen ranking of top cheese exporters are the United States (6th), New Zealand (7th) and Australia (13th). The country with the fastest growing cheese exports since 2013 was Belarus (+22.0%), followed by New Zealand (+19.5%), the United Kingdom (+14.3%), the Netherlands (+9.6%) and Italy (+8.8%). On the other hand, the country that experienced the greatest decline in cheese exports during the analyzed period was Germany (-14.3%), followed by France (-13.9%), Poland (-12.7%) and Belgium (-7.7%). 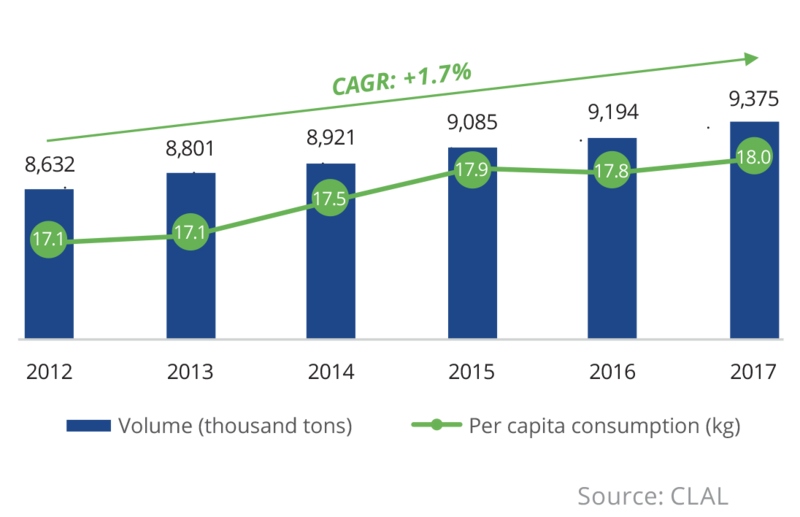 Despite the dairy industry’s stagnant growth and the contraction in drinkable milk demand in Europe, the volume of cheese produced has continuously risen over the last few years, peaking at 9.4 million tons in 2017 (CAGR of +1.7%, 2012–2017). Also, cheese consumption per capita has increased in Europe during the last few years, rising from 17 to 18 kg. 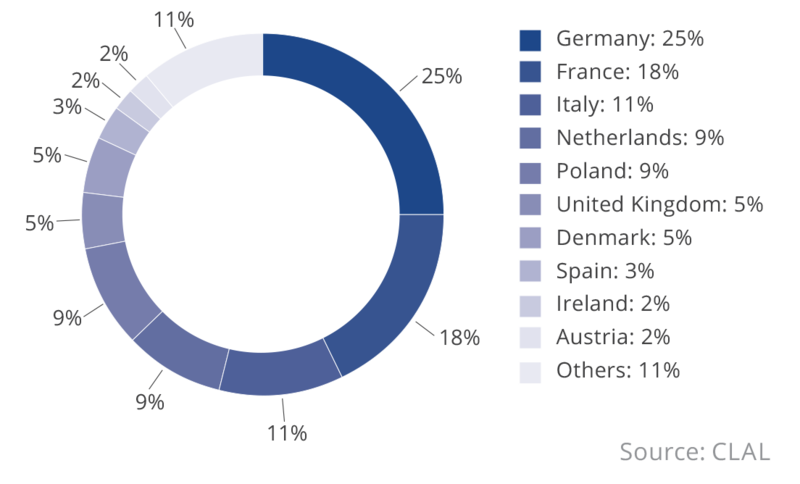 In 2017, Germany was confirmed as the largest cheese producer, accounting for 25% of total cheese produced in Europe, followed by France (18%), Italy (11%), and Poland and the Netherlands (both 9%). The chart above represents the top ten countries by per capita consumption of cheese worldwide in 2016. Notably, the entire top ten is composed of European countries. The Nordics take the lead in per capita cheese consumption: Denmark, Iceland and Finland consume 28.1, 27.7 and 27.3 kg, respectively. France ranks fourth with 27.2 kg and Cyprus is fifth with 26.7 kg, while Germany takes the sixth spot (24.7 kg), followed by Switzerland, the Netherlands, Italy and, finally, Austria.